Russell Crowe received a star on the Hollywood Walk of Fame on Monday morning in a ceremony attended by more than 500 fans. The New Zealand native received the 2,404th star with his "A Beautiful Mind" director Ron Howard, producer Brian Grazer and Jay Leno all in attendance. Aussie "Avatar" star Sam Worthington also made an appearance, Hollywood Reporter informs. 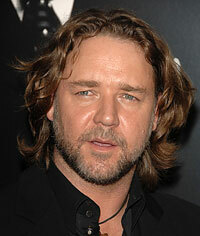 Crowe was born in New Zealand, but grew up in Australia. He appeared in his first movie in 1990, in "Blood Oath." The movie was a drama that chronicled war crimes in a Japanese war camp. He won his first academy award for his portrayal of "Maximus" in the 2000 hit movie "Gladiator." His upcoming role in "Robin Hood" is highly anticipated. It is reported that the film will focus on the younger years of Robin Hood, before he became an outlaw. He will reportedly not be wearing Robin Hood’s signature tights in the upcoming movie, Spreadit says. According to Entertainment Tonight News, the actor Ron Howard said of the occasion, "There's no place I would rather be, apart from with my family, than on a movie set." He told ET, "I suppose in a way it means I've been around awhile, and been making movies for awhile," going on to joke, "It basically just signifies that I'm getting really old." "No one could deserve a star more than Russell," Howard said. Grazer enthused, "I've been a beneficiary of Russell Crowe's talent on four different films. I'm just going to be a small part of this, but I want to congratulate Russell for getting this star. It's a tremendous honor."